The jejunum is an intraperitoneal organ, it is the second portion of the small intestine and part of the digestive tract. It begins at the duodenojejunal junction where it is related to the ligament of Treitz, and extends 8 to 9 feet, continuing distally with the ileum. Being intraperitoneal, it is anchored to the posterior abdominal wall by the double-layered mesentery through which the jejunum receives its blood and nerve supply. At the root (base) of the mesentery are the superior mesenteric vessels. The Latin word [jejunis] means "empty" or "fasting". The Latin term [jejunum] was used by the Romans to denote the first meal of the day, breakfast, when you have an "empty" stomach. 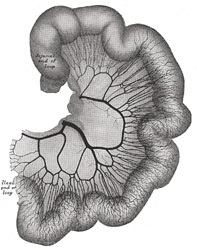 The term was associated with this segment of the small intestine, as it is most of the time found empty in cadavers being dissected. There is no clear anatomical boundary between the jejunum and ileum, as they blend smoothly one into the other. There are several gross changes from jejunum to ileum, one of them being that the complexity of the mesenteric arterial arches increases from proximal to dista. See the accompanying image. Click on it for a larger depiction. Two interesting side notes: In English, the term for the first meal of the day is self-explanatory: [break - fast], adding to the Roman concept of "fasting" or "jejunum". In Spanish, the term for breakfast is [desayuno], where the word [ayuno] means "fasting", therefore the word [des-ayuno] also means "the end of fasting". Look at the evolution (in Spanish) from [jejunum] to [yeyuno] (the Spanish term for the organ) to [ayuno], meaning "fasting" or "empty". The word [crus] is Latin (cruris) and refers to the leg, or region of the shin. It is commonly used to mean "leg" or "pillar". The plural form is [crura]. Several authors suggest a relation of [crus] with another Latin term [crux] meaning "cross" as if a cross is formed by two [crura] (legs). 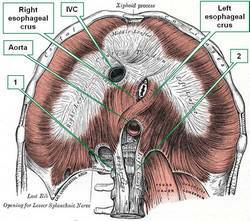 Special mention is deserved by the crura of the diaphragm. There are two pairs of diaphragmatic crura. 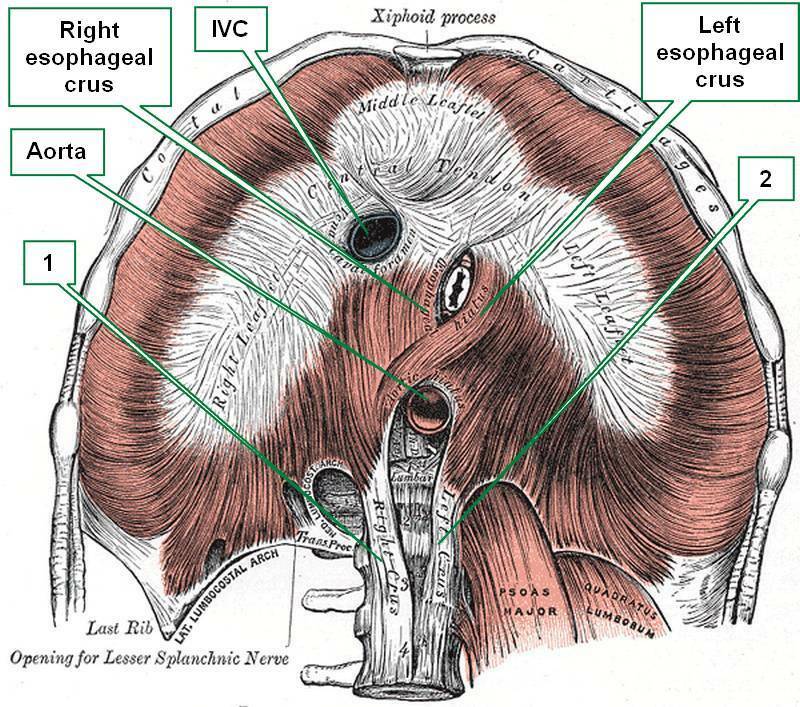 The esophageal crura (right and left) which bound the passageway of the esophagus from the thorax into the abdomen, the esophageal hiatus. The esophageal crura have a muscular structure. The aortic crura (righ and left) allow for passage of the aorta into the abdomen, and although muscular superiorly, they are mostly tendinous. 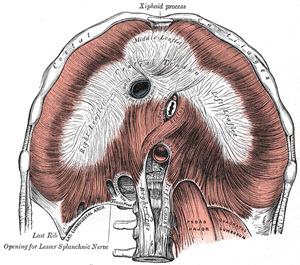 The accompanying image shows an anteroinferior view of the respiratory diaphragm. Click on the image for a larger picture. 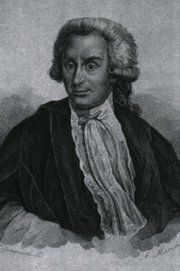 Luigi A. Galvani (1737-1798). Italian anatomist, surgeon, and physiologist, Luigi Aloisio Galvani was born in Bologna in 1737. Although he started his studies to join the church, Galvani followed with medical studies at the University of Bologna, where he became a skilled anatomist and surgeon. On July 15, 1759 Galvani obtained his degree in medicine and philosophy. 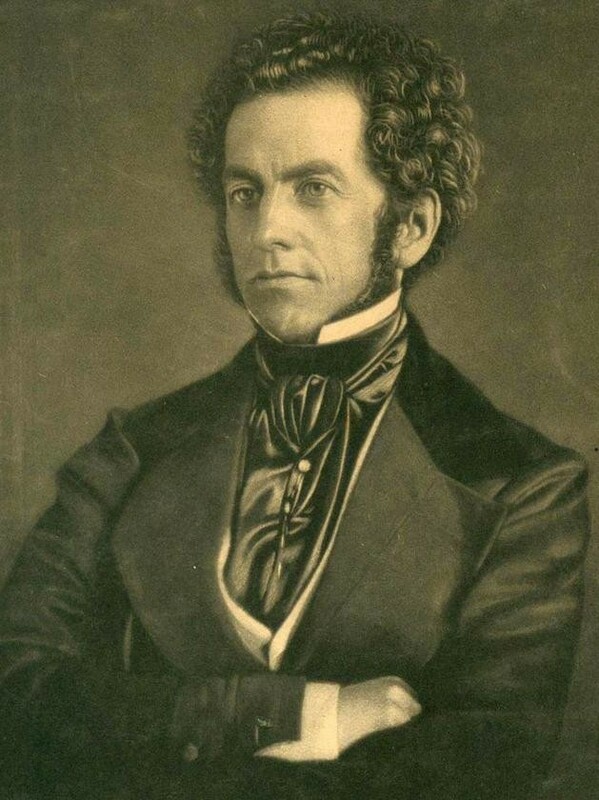 He was interested in the effects of electricity on tissues and through observation and experimentation he postulated the existence of "animal electricity", that is, electricity generated within the tissues. He postulated the possibility that nerves carried electricity. His theories led to a passionate controversy with Volta, who denied Galvani's postulates. Galvani's theories would only be confirmed after his death. Galvani was deeply religious, and when forced by government officials to take an oath of atheism, he refused. He was stripped of his position and was lead to poverty. His position was restored close to his death. In his honor, Andre Ampere (1775-1836) named one of his inventions that measures electricity, the "galvanometer". His name is also present in vernacular English, when we say that a rock star or a movie "galvanizes" an audience, meaning it was "electrifying"! The capitate bone is one of the four bones that comprise the distal row of the carpus or carpal bones that form the wrist. It is the largest of the carpal bones and is placed in the center of the wrist (see image). Its name originates from the Latin [caput], meaning "head". The capitate bone presents a large, rounded area, called the "head". To complete the homology, the capitate bone also has a narrow segment called the "neck", the rest of the bone called the "body". It is also known as "os capitatum" or "os magnum"
The capitate bone articulates with seven bones, including the scaphoid, lunate, trapezoid, hamate, and the three central metacarpals (2nd, 3rd, and 4th).